29 … Cattle and roads, history and food, lifestyle and occupations, ranches and town. Look both ways before crossing the adventurous streets of Alamos. 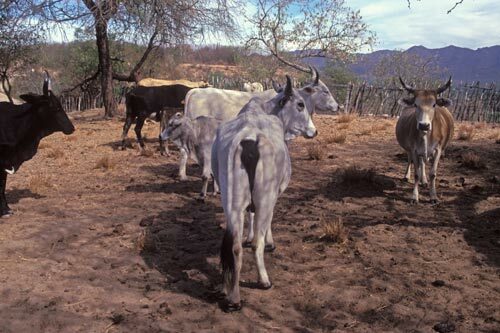 Sonoran cattle are known for their flavor. 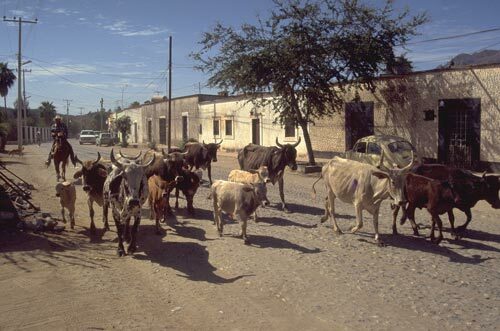 Álamos is surrounded by cattle ranches. This is an important aspect of the region’s economy. Hoof beats, clanging cow bells, and cowboy shouts add to the daily music that is Calle Miquel Hidalgo y Castilla, a busy and important street. This small cattle herd is headed west out of town to somewhere out there where the nearest neighborhood is that distant hill or lonely tree. On old El Camino Real, Eufracio Robles Luna is headed northwest out of Alamos. Yes, this is the famous El Camino Real. If you are from the coast of Southern – Central California you might drive on a portion of El Camino Real today. If you follow these cattle, and just keep on going you could end up in Petaluma, CA. At this moment, we are just past the Álamos airport. Álamos, Sonora, Mexico is behind us and the future of the Californias is ahead. Onward to San Francisco, Monterey, Santa Barbara, Los Angeles, San Diego and points in between. I spent part of my childhood near the El Camino Real, when it was an undivided two lane road with dirt shoulders, in Encinitas, CA. Today, that segment is six lanes wide with additional bicycles lanes, parking spaces and curbs. As I watched these cattle disappear around the bend I could hear my voice, laughing as a child, exploring undeveloped countryside way back when. And where do Álamos cattle go when their day's grazing is done? 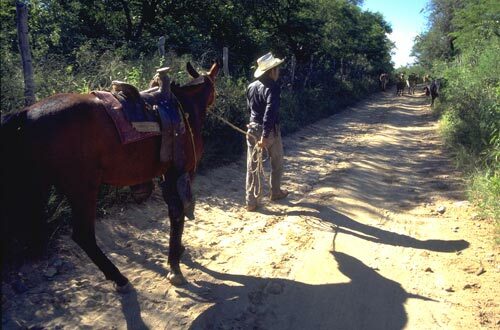 Not that long ago the best way to travel to Alamos was by mule train. Álamos has a 5,000 foot runway, at 1,300 feet elevation, awaiting your landings and takeoffs. The Álamos City Airport, to the west, is minutes away from downtown. Talk about arriving first class. It is a summer afternoon just west of the Álamos, Sonora, Mexico airport. There are a couple of small group of men, sitting in the shade, listening to music in Arroyo La Aduana. Cows, cow herders, sun, clouds coming and going, dogs and T.J. Cook are cast members in this gentle video. The year is 1996. To the east, the Cuchujaqui River is a nearby Álamos summer getaway. The Cuchujaqui River is to the east of Álamos, Sonora, Mexico. Three arroyos join together in Álamos and flow to the Cuchujaqui River, on to the El Fuerte River and ultimately the Pacific Ocean. It is a cooling retreat for Álamos folks especially in the hot summer. On this day, Antonio, an Álamos dentist, spear-fished one bass, a couple of catfish and many carp. There are different ways to get from here to there in Álamos, Sonora, Mexico : a cat rolling on its back, trucks and vans, horseback, walking with an umbrella or a cane and on and on from there to there and back again.